Disco Wagon is one of 17 3-year-olds entered in Saturday’s 400-yard Adequan Prairie Meadows Derby Challenge trials. ALTOONA, IA—AUGUST 30, 2018—Disco Wagon, a gelded son of Pyc Paint Your Wagon owned by Michael Pohl and Stacy Charette-Hill, is one of 17 3-year-olds entered in Saturday’s 400-yard Adequan Prairie Meadows Derby Challenge trials. Disco Wagon will be making his first start since July 8, when he scored a three-quarter length victory in the 400-yard, $78,000 Canterbury Park Derby in Minnesota. The gelding has earned $64,577 from four races this season. Disco Wagon drew post 4 and will be ridden by Jorge Torres in the first of two trials. The 10 fastest qualifiers will meet in the September 15, $37,500-added Adequan Prairie Meadows Derby Challenge final. Also on Saturday, 15 2-year-olds have been entered in two 350-yard John Deere Prairie Meadows Juvenile Challenge trials. 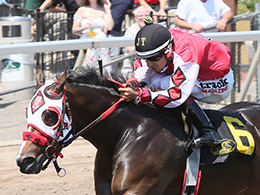 Thomas J. Scheckel’s Aqua Flash, a Grade 1 finalist during the Remington Park spring meet, drew post 6 and will be ridden by Roberto Valero for trainer Shawna Manriquez in the first of two trials. A gray daughter of champion First Moonflash, Aqua Flash is coming off of a sixth-place finish, 3 1/4 lengths behind winner Sunnysyde, in the 350-yard, $1.025-million Heritage Place Futurity (G1) on June 2. The 10 fastest qualifiers will square off in the $45,000-added John Deere Prairie Meadows Juvenile Challenge final on September 15.